Would you love to see a legend in concert? Have you longed for an evening of inspiration and Christ-centered entertainment? Then look no further! 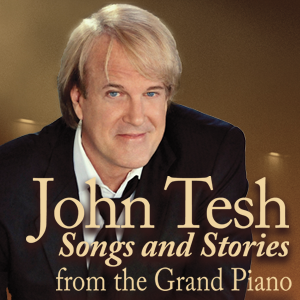 Charis Bible College presents John Tesh Live in Concert: Songs and Stories from the Grand Piano. At this special event, John will be sharing stories from his life and amazing healing journey. Join us at 7 p.m. on Thursday, April 25, at Charis Bible College in Woodland Park, Colorado, doors open at 5:30 p.m..
Best of all, admission is free! Don’t keep this to yourself. Bring your family and friends to what fans have called “the show of a lifetime,” and expect to receive a touch from God. You don’t want to miss this concert. It’s going to be awesome! Space is Limited. Proof of Registration is Required. Six music Emmys, two Grammy nominations, three gold records, seven Public Television specials and 8 million records sold. After more than three decades as an international entertainer, John Tesh’s recording and live concert career continues to thrive today. Whether at the solo piano, with a 12-piece ‘big band’ or an 80 piece orchestra, Tesh’s ability to create a unique journey for concert fans with music and storytelling has taken him from the Red Rocks Amphitheater and the Coliseum in Rome to Carnegie Hall and The Kennedy Center. John’s live television concerts, including the seminal ‘Live at Red Rocks,’ have raised more than 20 million dollars for Public Television. Tesh’s consistent popularity as a TV and Radio broadcaster has only amplified the personal connection with his loyal tribe of fans who get to listen to him 6 days a week on the ‘Intelligence For Your Life’ radio and television programs. The radio show alone amasses 34 million gross impressions/per week. John’s Facebook page has a weekly reach of 15-20 million engagements/week. The weekly TV program adds another 2 million impressions. Tesh and his marketing team regularly utilize these robust platforms to promote his live concert performances. Twenty five years and 50 plus recordings into his multi-faceted, ever-evolving musical and broadcast career, John Tesh’s highly successful and varied career path also includes a string of #1 radio hits, a Keyboard Magazine Performance award, 12 years as an investigative journalist for the CBS TV Network, a 10-year run as anchor on Entertainment Tonight, broadcast host and music composer for the Barcelona and Atlanta Olympic Games, and the unique distinction of composing what critics have hailed as “The greatest sports theme song in television history,” the NBC SPORTS’ NBA Basketball Theme. A self-proclaimed school “band geek” playing trumpet in marching and jazz bands in junior high and high school, Tesh was proficient on the trumpet and piano from the age of six. He studied privately with teachers from The Julliard School, and was named to the New York State Symphonic Orchestra in high school while also playing Hammond B3 in 3 Long Island rock bands.